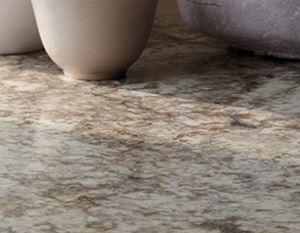 Hundreds of design choices and affordable, Laminate is practical and low-maintenance. Formica® Group, the century old innovator of laminate products, offers a wide selection colors, designs and textures that are attractive, yet durable. 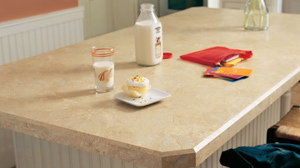 Formica brand materials can transform your home or office space with style and functionality while staying on budget. Wilsonart® brand offers a variety of finishes in an array of colors and patterns, allowing you the flexibility to choose the style that reflects your personality yet stay in your price range. Exclusive to Wilsonart brand is AEON™ Enhanced Performance Technology, that creates a significantly tougher surface that stays looking nice over time.